Up-and-coming elf pirate (sorcerer, unknown aquatic bloodline that manifests visibly only in his subtly alien demeanor and slightly large eyes) with an unpredictable nature and a tendency towards evil. He's ruthless and manipulative, and prone to telling bald-faced lies about his past if it will help him build trust with others. He has few loyalties, and turns to violence when it suits him to do so. He's slim and physically frail, and rarely uses weapons or wears any kind of armor. He struggles with physical labor on-board the ship, but has recently managed to attain the status of first-mate and thus escape from almost any work that doesn't involve manipulating the captain and giving orders. 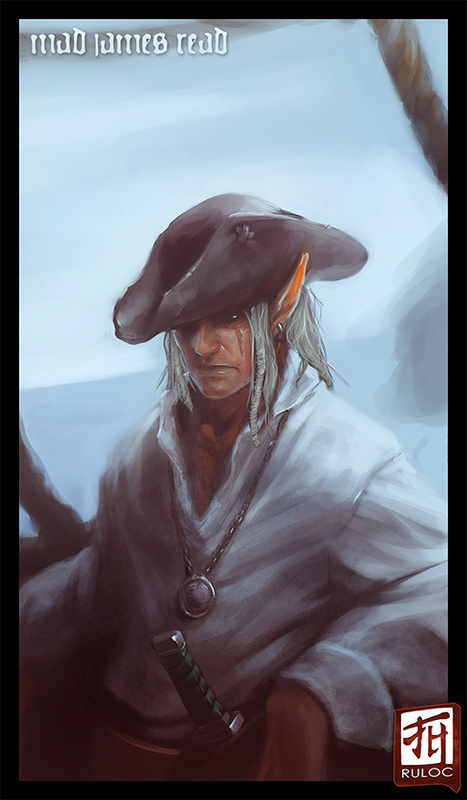 He's been press-ganged into the pirating life against his will, but has found that his affinity to water and lack of empathy make him well-suited to survival on the seas. He's most likely dirty and weather-beaten, like the rest of his crew. He's fragile but confident in his ability to solve problems and turn people (and circumstances) in his favor when necessary. Scar: He has an intimidating scar that crosses over his left eye from brow to cheek, which resulted from a spiked grate dropping on his head, nearly killing him. Equipment: Magic silver amulet, assorted potions, hooded lantern, and a rarely-used knife. Otherwise, wears typical pirate garb.